Once registered at reception please make your way to the enchanting Elf & Fairy Village where you will test your skills on our Junior Woodland Adventure Course and our new giant Bouncing net play. Following this, children can have play time in the Elf & Fairy Village. €16 per person (Minimum of 10 children). The group will then take part in Tree Top Adventure Walk for 40 minutes of walking between wobbly bridges, nets and swings in the tree tops. 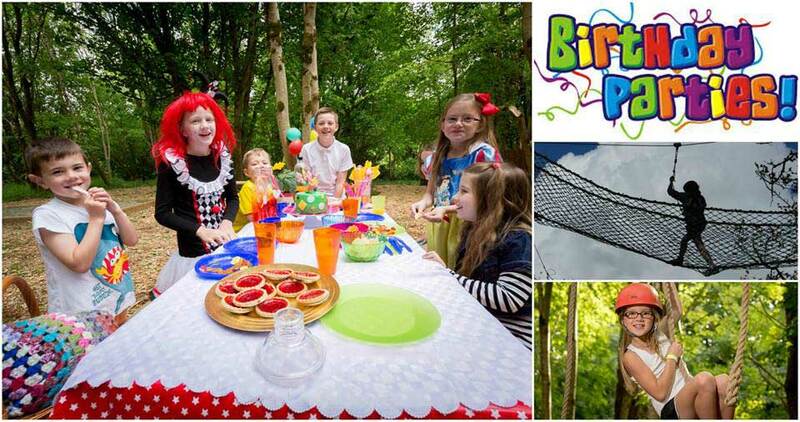 Following Party food, children can have play time in the Elf & Fairy Village and Timber Tumbles Playground. €19 per person (Minimum of 10 children). Challenge yourself on the Octagon High Ropes Course and finish off with our 300m Zipline across the lakes. For just €32 per person (Minimum of 10 children). Add on activities: Archery €3pp; Climbing Wall €3pp; Orienteering €1pp; Coal-mining & fossil museum €2pp.